This section has information about all things mountain – check the BUSINESS section for more commercial operations. The Adventure section has links to outdoor activities like walking and mountain bike riding. The BLOG section has links to individuals walking, skiing, riding sites. The Keep Winter Cool initiative in Australia is led by a partnership between the Alpine Resorts Co-ordinating Council (ARCC), the Australian Alps Liaison Committee (AALC), and the Australian Ski Areas Association (ASAA). OZTEX. Research looking at climate change in the Alps. VNPA website on the Alps. Briagolong Community Portal. “Briagolong is a small town, with a strong artistic and alternative community, which blends well with families that have been in the town for five generations. It is the last town on the Central Gippsland Plains before the Great Dividing Range”. Go Marysville. Focus on the re-building of Marysville. “Marysville is in the early stages of rebuilding. We invite you to follow the progress and the amazing stories through our video and photo galleries. New stories are added on a regular basis with interviews, businesses are starting to re-open, Bruno’s garden is coming to life again, and the town is now planning its future”. Goongerah community portal. Website of the Goongerah community, put together by the Goongerah & District Arts Education and Employment Inc group. Marysville community website. Focus on the community and re-building after the fires. Snowy Mountains community website. “website for Snowy Mountains Communittee Groups, Local Business, Locals and Lake Jindabyne Chamber of Commerce Members”. W Tree community portal (W Tree is about 20 km north of Buchan in East Gippsland). Australian Alps National Parks website. Mittagundi. Mittagundi is an opportunity for young people 14 to 18 to live and enjoy the challenges of a remote and simple lifestyle. Info here. Wollangarra is an independent non-profit outdoor education project established in the firm belief that young people and mountains are natural partners with a great deal to offer each other. The pioneer-style homestead, which serves as our base camp, is situated on a small, remote river flat of the Macalister River, half way between the towns of Heyfield and Licola. Skiing to snowboarding, hiking to biking, everything about those huge piles of dirt and rock keep our blood flowing. Our team strives to provide you with detailed weather, conditions and vision of our most used mountain areas in Australia, New Zealand and the world. All for Free. Oz backcountry. Australian backcountry ski site. A damn nice effort – mostly the Snowy Mountains main range, stunning pics and good basic info. skiing on Mt Bogong, highest peak in Victoria. Youtube vids. Wikiski backcountry ski guide. Detailed info on backcountry ski areas in Australia. Winter Dreaming. Stephen Curtain’s iconic telemark ski film on the Australian Alps. Alpine Link is “the Internet gateway to the Alpine Region and North East Victoria, Australia, particularly its tourism sector. Providing information on accommodation, activities, festivals and events, food and wine and the local communities”. King Valley. Information for tourists visiting the King Valley in NE Vic. The Alpine Resorts Co-ordinating Council, or ARCC, is established under Victorian legislation to plan and facilitate the establishment, development, promotion, management and use of the six Victorian Alpine Resorts. 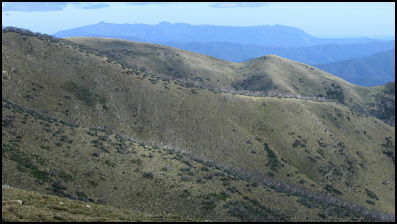 an appreciation of the Bogong Bioregion. Details here. Australian Alpine Club. The AAC oversees ski lodges at Mount Buller, Falls Creek, Mount Hotham, Dinner Plain, Perisher in Australia and Niseko in Japan. Heritage Rat. “Rediscovering the forgotten goldfields of the Victorian Alps”. The Snowy River. Detailed info on the River, from the headwaters to the ocean. Wild magazine. Australia’s own backpack adventure magazine, now in its 30th year.